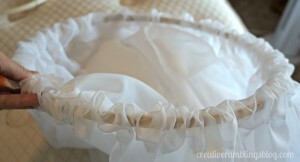 This week I set to work on another pretty little feature for my daughter’s room, an Easy DIY Princess Canopy. I don’t have a particular theme for this room but I think I’m going for pretty and girly with some modern touches. The first big change was moving her from a toddler bed to a twin bed and creating this pretty Upholstered Headboard. Last week I spent some time trying to create the perfect wall art and gave up. I don’t want to rush it and end up with something I do not like. I know if I hold off something will inspire me. 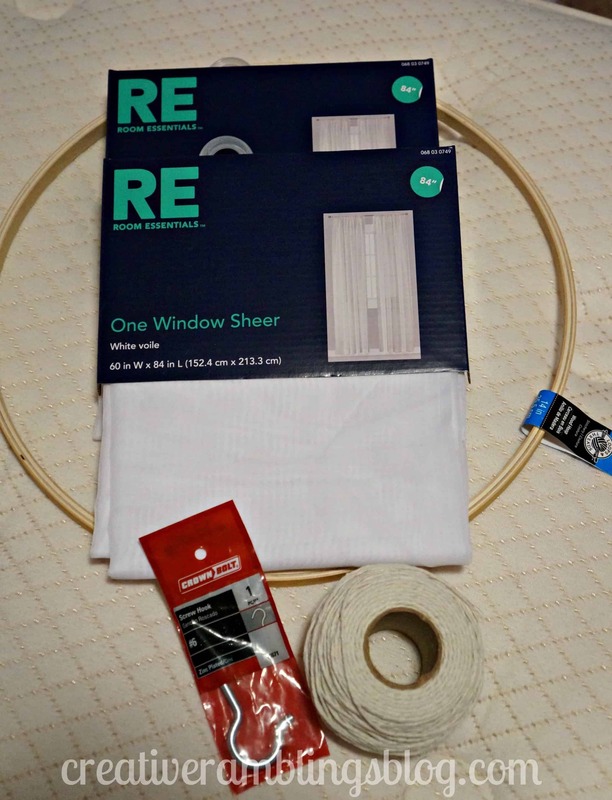 So onto the next project….a Princess Canopy! 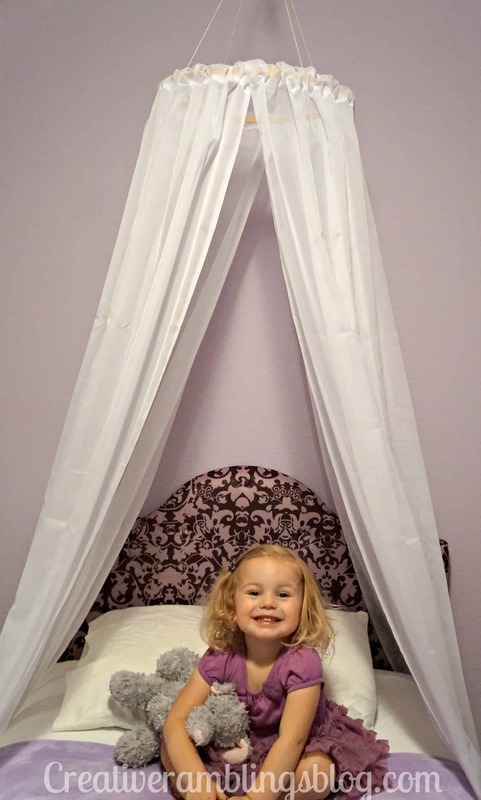 When I told the Little Lady I was making a princess canopy she got wide eyes and a big smile. 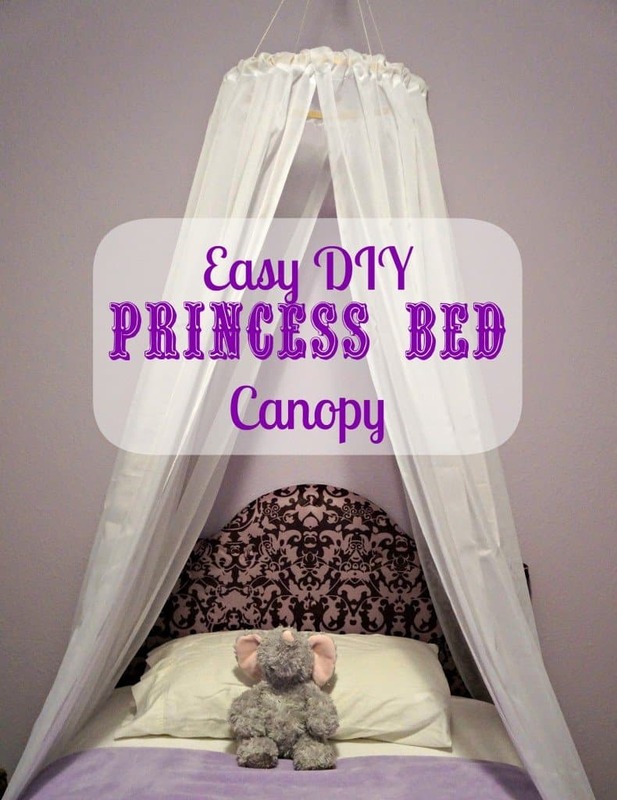 Who doesn’t want to sleep under a princess canopy? I have been looking at tutorials for a while and came to the conclusion I did not want to sew. There had to be a better way. Then I stumbled upon this awesomely easy tutorial from Craftaholics Anonymous. I couldn’t believe how easy this was. First I centered the bed on the wall and marked the center of the wall on the ceiling. Next up took 4 pieces of white twine and tied them to the inner hoop evenly spaced apart. Then I tied them together at the top, adjusting as needed so the hoop would hang straight. 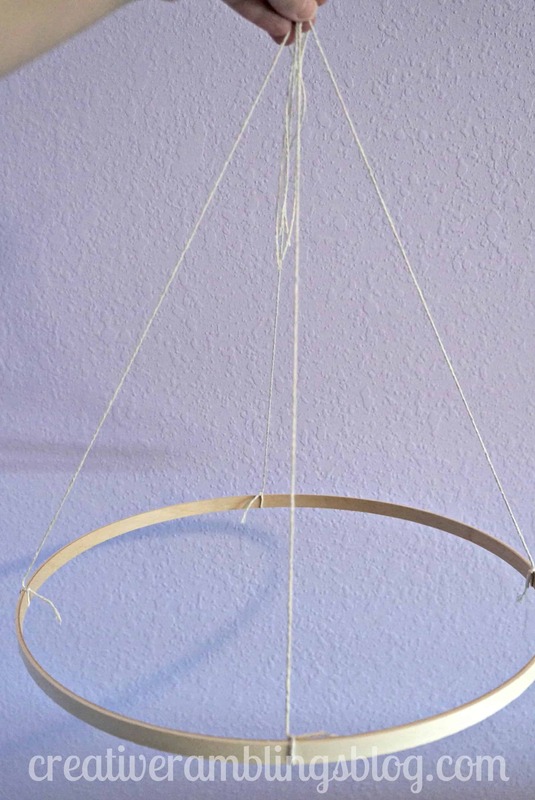 I made a loop with all 4 strings at the top to hang the piece from the ceiling. Next up I threaded the curtains onto the outer hoop. I spaced them out so the ruffle looked pretty and the opening between the 2 curtains was toward the front (opposite of the screw on the hoop). Then I put the inner hoop into the outer hoop and tightened it. I screwed the hook into the ceiling and then hung up the canopy. 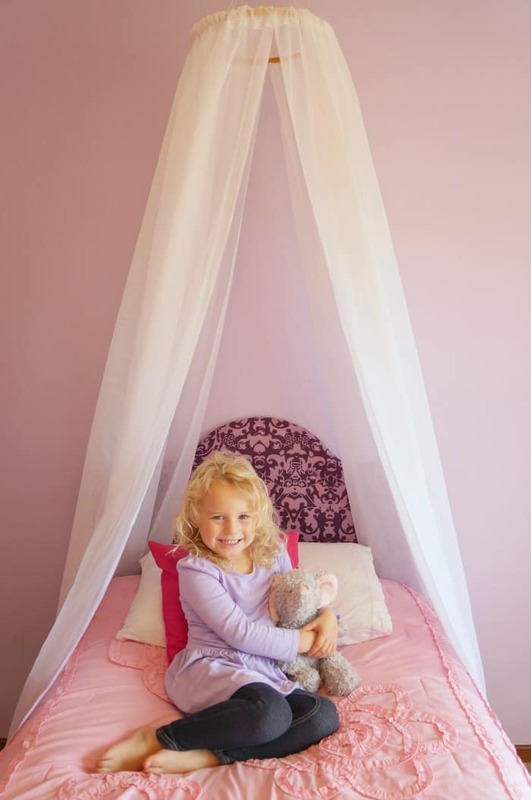 Little lady loves her princess canopy, and so do I. We both laid in her bed yesterday with the window open and a nice breeze, it was so cool! Update: When I created this tutorial video 2 years after the original post, I took a few more photos of my now 4 year year old. She still loves her canopy (and purple)! I shared a Facebook Live on a version of this canopy with lights for my younger daughter’s room. You can watch that here. Tell me, what you think? Do you have a theme for your child’s room? I’d love to hear about what you are doing or have done. Like simple inspiring projects? You’ll love this one. I love it too!! I’m thinking of making one for my daughter. Do you think it would look odd in front of a window? Her bed is centered on a window and I’m not sure if I should move on with the plan? If you use sheer curtains I think it would look really pretty, you would sunlight filtering through it. Best of luck, thanks for stopping by! Very fun! My daughter would LOVE one of these! Thanks for sharing and for your sweet comment on my blog! Thanks Mindi, glad you stopped by. Giving your great diy a shout out tomorrow. I remember making one for a reading nook when my 11yr old was little she loved it. Hope to see you at the party again soon or just pop by for a visit. Grab a featured button if you like & see your shout out tomorrow. Awe thank you so much! Love your blog, I’ll be back soon. Thanks Jenna, she does LOVE it! This is just the tutorial I was looking for, and easier than I expected. I think one upgrade that would make it positively brilliant would be to string beads/crystals along the white twine! Thank you so much!! Heather the beads would be so pretty. I’m glad you found this, have fun with yours. Yay! 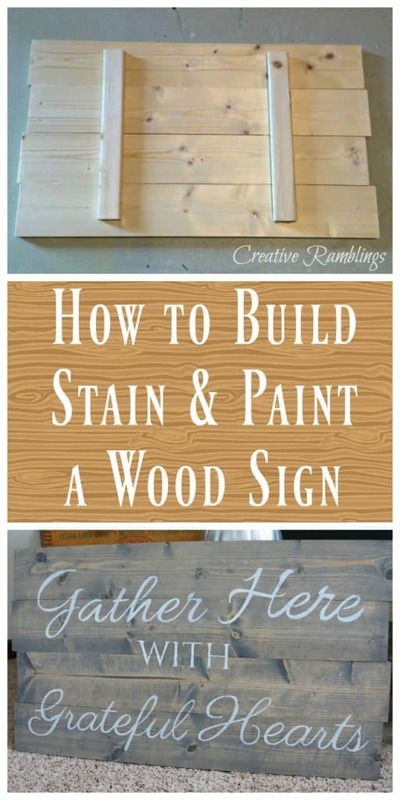 Thank you for this easy step-by-step DIY. I actually read the DIY on Pinterest before I found yours and I felt it was a bit confusing when it came to tying the ribbons onto the inner hoop. But yours was clearer! Great job and it looks good too! Thank you Kim, I’m glad it is easy to follow. Have fun making it! I’m in a college dorm and considering making one to block the light from my roommate while I sleep. Id wanna use a regular lightweight curtain instead of sheer. Wish me luck! I need more sleep. Oh that’s a great idea, one point of advise. If my daughter pulls on the curtain is does come down, the little hoop stays on the cieling and the big hoop falls. 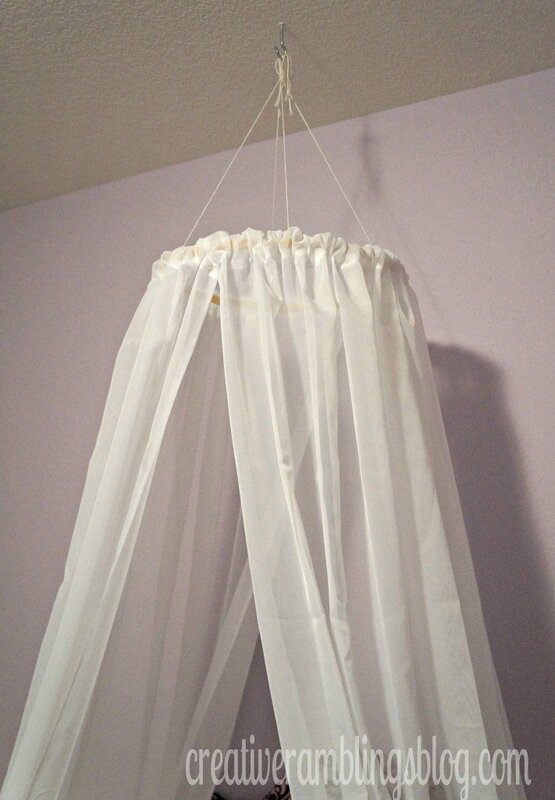 If you use a heavier curtain you may want to attach the 2 hoops together, even with just some string. Good luck, hope it helps you sleep! In IKEA by me they sell something almost identical and charge $40. You did a beautiful job I’m going to make one for my own bed and I’m 39 years old. I’m thinking of hanging string lights or this little pink paper lantern I got at Michael yesterday. Thanks for the inspiration. Great job!!!!! Yay for a grown up canopy! I love that idea, have fun with it. Thank you for the sweet compliment. I made this a little differently…with sparkly sheer curtains that tie at the top, and used it to go around my little meditation nook. So great! Thanks for sharing your creativity! I bet that is a very relaxing nook. Thanks for sharing! This is exactly what I needed for my daughter’s room. She has a day bed so with hers I am going to drape the curtains across the ends of the bed and add lights down the curtains. Thank you for the tutorial. I am so happy you found this Jennifer, that will look beautiful on her day bed! Hi! I love this and it looks so easy! Could I get a 23 in hoop and make a reading nook, play area for my daughter, she’s 7. Would that be big enough? Do they make bigger hoops than that? With the 23 in I’d prolly do like. .6 curtains instead. Would cotton ones work? Or do you suggest to use the light see through ones like you used? Thanks! A reading nook would be so fun. I definitely recommend the lighter weight curtains, anything too heavy and the tension from the hoop won’t hold. Have fun! Do you think this would work on a hula hoop? It could work, it would just be bigger. Make sure you get curtains that have a rod pocket big enough to go around the hula hoop, then cut the hula hoop and slide on the curtains. Let me know how it turns out! I did use a hula hoop! I cut it open and threaded the pink ombre curtains my 3 y/o picked out, then used a pen in the joint to stabilize the place where I cut and taped it all together again. anyway, my daughter LOVES it. Thanks for your inspiration. Hey Sarah, I wish my ‘little’ girl was little again…I’d make this in a second. But sadly, she’s a sophomore in college now (sad face!). But this is so darned cute…and great instructions. What a sweet bed for a curly blonde cutie! I’m so glad to hear that, I bet this looks magical in a garden. Thanks for sharing your project. So beautiful, thank you very much for sharing. That’s what I was looking for.